After 2nd Battalion and 5th Battalion of the Gloucestershire Regiment returned to England from France in 1940 they were brought up to strength, retrained and re-equipped for the invasion of Nazi-occupied Europe in 1944. 2nd Battalion remained an infantry Battalion but 5th Battalion was converted to 43rd Reconnaissance Regiment which, equipped with armoured cars would act as the eyes and ears of 43rd (Wessex) Division in 1944-45. 2nd Battalion came ashore at Gold Beach on 6th June, D-Day, as part of 56th Brigade, which was the first allied formation to enter Bayeux the following day. 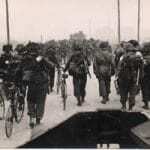 During the build-up of the Normandy bridgehead 56th Brigade was an independent formation used to bolster up other Divisions where required, and began the invasion attached to 59th Division. Besides 2nd Battalion Gloucestershire Regiment, 56th Brigade contained 2nd Battalion South Wales Borderers and 2nd Battalion Essex Regiment. Its formation sign was a yellow sphinx on a black half circle, chosen because all three regiments had taken part in the Egyptian campaign of 1801. “Corporal Braid, of No. 13 platoon, hearing amidst the din a heavy rumbling on the road outside, looked out of a window ready to welcome a 7th Armoured tank. Instead, he saw, and they saw him, a German Mk IV with a section on it armed with Schmeissers. The Boches piled off the tank in quick time and No. 13 platoon left the house equally quickly, leaving behind their small packs and shovels which they had discarded during the house searching. They had no answer to the pounding this tank shortly gave the houses in which they had been. Tilly finally fell to the British on 19th June, and Panzer Lehr was all but destroyed. “. . . Thury-Harcourt, for sheer noise and stonking, was one of the worst battle we had throughout the campaign. . . After the battle the squadron commander of the 34th Armoured Brigade summed up the efforts of the 61st [2nd Battalion, Gloucestershire Regiment] by saying that never before had he seen men fight with such bravery and determination against such fearful odds. However, the Germans had withdrawn at the same time, having suffered severely themselves, and left the village unoccupied when the Gloucesters entered it the following day. ” . . . “D” Company with its tanks was to lead the way on the main axis and their first task was to take the fort. In the meanwhile, “A” Company, supported by tanks, was to find out the “form” on the right. For the rest of 1944, 2nd Battalion advanced with the Canadian Army through Belgium and into the Netherlands, fighting numerous minor engagements along the way, and ended the year at Elst, between Utrecht and Arnhem. 43rd Recce continued to perform its allotted task during the liberation of France, Belgium and the Netherlands, including the Market-Garden campaign in September, and ended 1944 at Heerlen in the Netherlands. Picture: Soldiers advancing inland from the Normandy beaches. Thought to be “B” Company, 2nd Battalion, The Gloucestershire Regiment.